Succeed in Cambridge KET for Schools. 6 Practice Tests. Global ELT, 2011. — 112 pages. 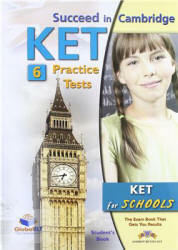 - 6 complete Cambridge KET Practice Tests that help you become familiar with the format of the exam. - The Succeed in KET Practice Tests are at the appropriate level of language difficulty.